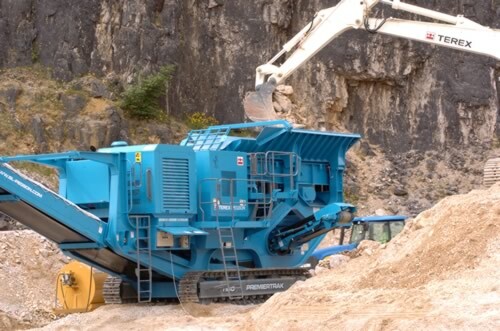 Mobile crushers are used in a wide range of industries, including quarrying, ore processing and recycling of demolition waste. This guidance is for all those with responsibilities for the operation of mobile crushers, including contract managers, supervisory staff and operators of these machines. It covers the safe operation of the mobile crushing operation and includes guidance on clearing blocked crushers. This guidance cannot cover every risk and is not comprehensive. It does not attempt to detail individual machinery safety concerns, but will only highlight those key matters of concern. The risks associated with your particular operation, and the methods of reducing those risks, should be revealed during your risk assessment. 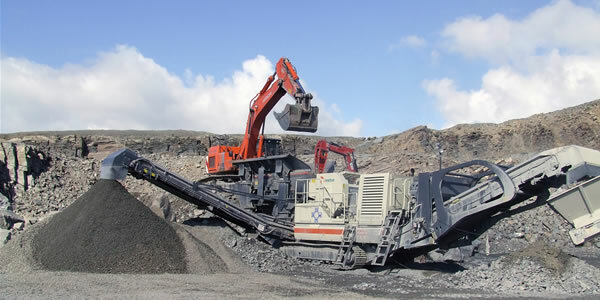 Mobile crushers are versatile pieces of equipment with many uses. A properly planned operation will be efficient, safe and productive. A poorly planned operation will be unproductive, dangerous and inefficient. These machines can, and have, killed. Mobile crushers will normally be fed from loading shovels, backhoe excavators or from other processing machinery (e.g. sizer/separator, elevating conveyor, etc). In its simplest form it will be a standalone machine, fed directly with the material to be crushed and discharging to a stockpile ( see Fig 1 ). If the material to be crushed is reinforced concrete, then generally a magnetic separator will often be positioned over the discharge conveyor to remove the metal and prevent it from contaminating the production run material. Excavator standing pads should be suitable (stable) and should be high enough for the operator to be able to monitor the feed hopper from the cab. Safe access to the excavator must be provided for the operator ( see Fig 2 ). Where wheeled loading shovels are used, then the ramp should be wide enough to allow for adequate edge protection (min 1.5m high) on either side of the ramp as well as for the travel of the machine. The last few metres of the ramp should be level so that the machine is not discharging uphill, thus enabling operators to more easily monitor the feed. The loading shovel will also be more stable. Ensure pedestrians and obstructions are excluded from the bucket operating arc. All dangerous parts of machinery should be suitably guarded. Failure to replace guards (on crushers and conveyors) after cleaning or maintenance work is a major cause of injury on these machines. A properly designed mobile crushing operation should not need any person to be present on the crusher access platform during normal crushing operations. Struck by objects ejected from the crusher, such as bits of stone or metal. The operation of the crusher catches being struck by any reinforcing bar as it. Being pulled into the crushing chamber when attempting to pull out contaminants (e.g. reinforcing bar). Struck by the loader bucket if the access platform is within the working radius of the loading machine (for 360 degree excavators). Falling if adequate guardrails and access arrangements are not provided. Noise. Process noise at this level can cause deafness and adequate hearing protection is required. Dust, especially in the case of crushing concrete or bricks or any other high silica content material. Breathing silica dust can cause serious respiratory diseases. HSE Guidance on Silica. Whole body vibration. Anyone on the platform would be subjected to constant low frequency vibration. It may be necessary for a person equipped with the appropriate PPE (e.g. ear defenders, dust mask, eye protection, hard hat, protective footwear, high visibility outer garment) to spend a few minutes setting the feed speed initially if there is no remote facility. The feed should then be controlled from the machine feeding the crusher by varying the loading rate into the feed hopper. Unsafe placement of material removed from the crusher. The preferred method of clearing a bridged crusher is by the use of a hydraulic arm (typically a360 excavator fitted with a quick hitch bucket attachment and either a static pick or a hydraulic hammer available). Depending on the result of your risk assessment, clearing out a bridging blockage with a hydraulic arm (with pick attachment) may be carried out with or without the crusher still operating. When hydraulic arms are not available and cranes slung with hooks have proved ineffectual, other methods are necessary. When it becomes necessary for a person to enter the crusher to position hooks or slings, the crusher and feeder must be stopped, isolated and locked off (in accordance with manufacturers/suppliers instructions) and safety harness worn. Where other options are to be considered they should be subject to a detailed and thorough risk assessment. The crusher should be shut off and isolated before considering the use of bars and hand hammers. Careful consideration should be given to the risk of large pieces of feed material moving and causing trap or crush injuries. Wedges should not be used due to the risk of them becoming a projectile (This has caused fatalities in the past). Other options, which require more specialist expertise and competence, include: gas or chemical expansion, hydraulic ramp plates, permanently mounted hydraulic breaker (may include the use of closed circuit television CCTV to assist the operator), use of explosives. If, after careful examination, there appears to be no electrical or mechanical reason why the crusher has stalled, it may indicate that the crusher is jammed by tramp metal. A "stalled crusher permit to work" system should be implemented. This work should only be carried out by person/s who are suitably trained and competent. Wherever possible any inspection of the crushing cavity of a jaw crusher should be carried out from below the crusher, not from above. Fatal accidents (due to material being ejected) have occurred to people who have examined the crushing cavity of a stalled crusher from above. Inadequate guarding is a major cause of injury. Guarding integrity should be checked at regular intervals, particularly after cleaning or maintenance work. Keeping clear working areas clear of spillages improves operational efficiency and also reduces the risk of slips and trips – a major cause of lost time accidents. Maintaining the correct adjustment and condition of belt scrapers. Ensure that any feed conveyor discharges centrally into the feed hopper. Designing loading shovel ramps to minimise the amount of material that will spill from the ramp itself. Never remove guards to clean up while the machine is in operation. If guards need to be removed, shut off and lock off. It is essential where possible to segregate pedestrians from moving plant such as loading shovels, excavators and dump trucks by the use of physical barriers.